Practice Heat Transfer questions and answers for interviews, campus placements, online tests, aptitude tests, quizzes and competitive exams. 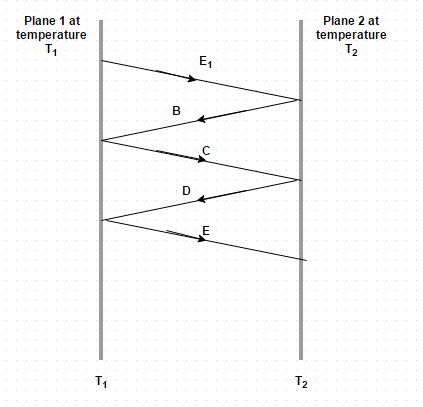 This set of Heat Transfer Question Bank focuses on “Heat Exchange Between Non Black Bodies”. Explanation: The surface 1 emits radiant energy E 1 which strikes the surface 2. From it a part α2 E 1 is absorbed by the surface 2 and the remainder (1 – α2) E 1 is reflected back to surface 1 and so on. Explanation: Q 12 = F 12 A 1 σ b (T 14 – T 24). Since T 1 = T 2, we get Q 12/A1 = 0.
a) 2/ [1/E 1 + A1/A2 (1/E 2 – 1)]. b) 1/ [1/E 1 + A1/A2 (1/E 2 – 1)]. c) 4/ [1/E 1 + A1/A2 (1/E 2 – 1)]. d) 3/ [1/E 1 + A1/A2 (1/E 2 – 1)]. Explanation: This is the interchange factor for the radiation from surface 1 to surface 2. Explanation: Q 12 = F 12 A 1 σ b (T 14 – T 24). F 12 = 1/ (1/E 1 + 1/E2 – 1) = 0.01266. Explanation: Q 12 = F 12 A 1 σ b (T 14 – T 24). F 12 = 0.85 and A 1 = (0.25)2 + 4(1.5) (0.25) = 1.5625 m2. a) 1/ [A1/A2 (1/E 2 – 1)]. b) [1/E 1 + A1/A2 (1/E 2 – 1)]. c) 2/ [1/E 1 + A1/A2 (1/E 2 – 1)]. d) 1/ [1/E 1 + A1/A2 (1/E 2 – 1)]. 7. What is the geometric factor for infinitely long concentric cylinders? Explanation: The inner cylinder is completely enclosed by the outer cylinder and as such the entire heat radiations emitted by the emitted by the inner cylinder are intercepted by the outer cylinder. 8. What is the geometric factor for concentric spheres? Explanation: The inner sphere is completely enclosed by the outer sphere and as such the entire heat radiations emitted by the emitted by the inner sphere are intercepted by the outer cylinder. Explanation: The factor f 12 is called the interchanging factor from surface 1 to surface 2. 10. A thermos flask has a double walled bottle and the space between the walls is evacuated so as to reduce the heat flow. The bottle surfaces are silver plated and the emissivity of each surface is 0.025. If the contents of the bottle are at 375 K and temperature of ambient air is 300 K. What thickness of cork (k = 0.03 W/m degree) would be required if the same insulating effect is to be achieved by the use of cork? Explanation: Q = k A (t 1 – t 2)/δ. So, δ = 0.268 m = 26.8 cm. 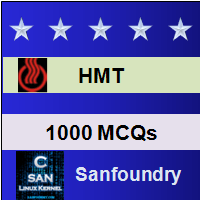 Sanfoundry Global Education & Learning Series – Heat Transfer. To practice Heat Transfer Question Bank, here is complete set of 1000+ Multiple Choice Questions and Answers.